The Chateau de Versailles is the most extravagant palace built in Europe, by one high spender King Louis XIV, who is perhaps better known for his infamous wife, Marie Antoninette. Versailles, at 20km south-west of Paris, was the royal court at the beginning of the 18th century and which boasts an incredible 700 rooms, and that’s just the main Chateau. In addition to that there are also a number of Trianons and even a hamlet built just for Marie Antoinette. 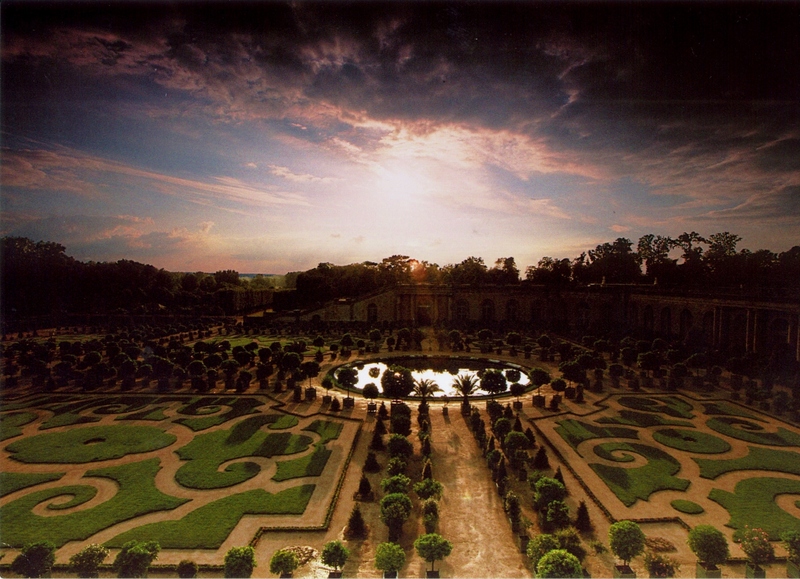 This postcard overlooks the Orangerie at sunset, which lies just to one side of the palace. It was actually the first part of the gardens that we visited, and the part we loved the most. Although this postcard depicts a sunset, we took a stroll through the Orangerie at around 10am before the crowds discovered this haven. Currently there’s a great exhibition of South Korean photographer Ahae, showing photos taken of the nature outside a single window. He spent 4 years at this one window taking over 2.6 million photos in total, to arrive at this magnificent collection. Versailles was indeed very impressive, although we were more enamoured by the gardens than the palace. The Hall of Mirrors is indeed striking, but the rest of it felt very similar to stately homes and castles in England. For me, the gardens and their many fountains, whose trickling noise is accompanied by Baroque classical music in the background, are what truly impressed me. The upkeep must take an army of clandestine or night-time gardeners, and the sheer scale is enough to leave you with sore feet if you intend to explore it all. Alternatively you can take a rowing boat onto the Grand Canal to give those feet a rest. And finally, at all costs, aim to visit on a weekday! It’s closed on Mondays, and busy on Tuesday, but Wednesday-Friday should be idyllic. Like the Musée d’Orsay, it’s free to visit the Chateau for citizens of the EU under 26. Beautiful indeed! I visited during winter, nothing much to see though. Pingback: Encore un moment! | One quality, the finest.